Vlanhonder Moslin is an Imperial publican and the proprietor of Moslin's Inn in the infamous settlement of Hackdirt. His grandfather was Irlav Moslin, the founder of Hackdirt and author of the obscure text Bible of the Deep Ones. Like the other inhabitants in Hackdirt, Vlanhonder is a devout worshipper of The Deep Ones and is partly responsible for the disappearance and planned blood-sacrifice of Seed-Neeus’ daughter Dar-Ma. The inn is located in the northern part of town and is dark, messy and uninviting. Vlanhonder spends most of his time in the reception room on the ground floor, wandering around in the dark, doing his best to scare off unwelcome strangers. He leaves the inn at 8pm and heads for the Chapel of the Brethren for a gathering with the other cultists. They all spend the next five hours listening to Etira Moslin reciting passages from the Bible. At 1am, the group rises from their benches and enters the Hackdirt Caverns where the mysterious Brethren await. In their presence, Vlanhonder spends the next five hours silently worshipping the Deep Ones. At 6am, he surfaces back in the inn through the trapdoor and gets ready for another day of scaring customers away. Unlike the other cultists, Vlanhonder is unarmed and only wears a set of lower-class clothing, including a shirt with suspenders, a pair of tan linens and thick cowhide shoes. He carries the Hackdirt key and a small amount of gold. The first time you approach him, he will give you one of three possible Hackdirt “greetings” and simply treat you like dirt. He proves a bit more talkative when asked about Hackdirt: "My grandfather built this place, not that it is any of your business. We been down, but we got plans to bring back the good old days. You'll see.” When asked about Dar-Ma he will get insecure: "Who? Nah, I haven't seen any young women around. Even if I had, why would I know anything about her goin' missing? Not that I’m saying I ever seen her. Cause I haven't." And when you decide to investigate further and rent a bed, he will say: "I guess we've got a room available. 30 gold per night. Take it or leave it." If you take it, he will point you upstairs: "Fine. Take the stairs up to the right, the room on the left. No visitors allowed. And no pets." When you confront him with Dar-Ma's Diary his memory suddenly gets a little better: "Oh, you meant the Argonian wench. Must've slipped my mind. Yeah, she was here. Then she left. I don't know nothin' else about it." When you confront him again, he will get angry: "How would I know? Maybe she went crazy and run off into the woods. Now if you'll excuse me, I got things to do." 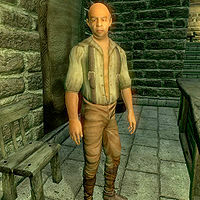 Although Vlanhonder is technically a merchant, he is never scheduled to provide services, and therefore it is impossible to ever barter with him.